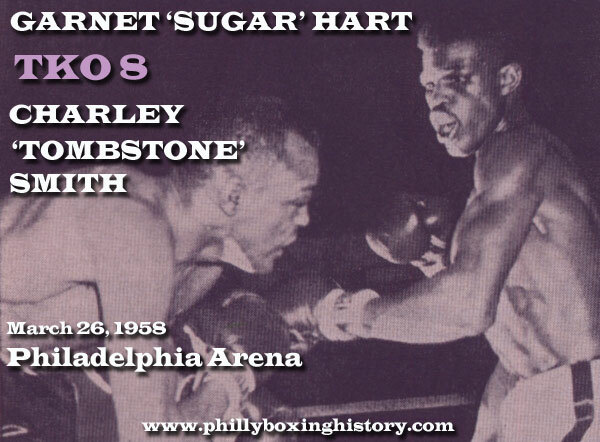 PHILADELPHIA, March 26 (AP) - Garnet (Sugar) Hart closed Charley (Tombstone) Smith's right eye in the fourth round of their scheduled 10-rounder tonight and went on to stop the California welterweight with a technical knockout at 56 seconds of the eighth round. Smith was the aggressor throughout the bout, and was fairly even with the Philadelphian when Referee Dave Beloff called a halt to the fight. Hart, at 147, outweighed Smith, of Los Angeles, by a pound and a half. The bout started out as a match of Hart's speed and quick hands against Smith's forcing tactics. For two rounds it appeared as if Hart's left jab and lightning hook would be enough to carry him to an easy win. But in the third round, Smith stepped up his pace and made a match of it. In the fourth, he stunned Hart within the first minute and kept after his dazed opponent, almost downing him once. But Hart came out of his shell with a left hook that closed Smith's eye and eventually decided the outcome.